In Izabella's kinder class they occasionally do a themed color day. They are supposed to wear the special color of the day, they have special themed color activities, and they have a themed color tasting party in the afternoon. Iz has been waiting since the beginning of the year with great anticipation for pink day since pink is her absolute favorite color. 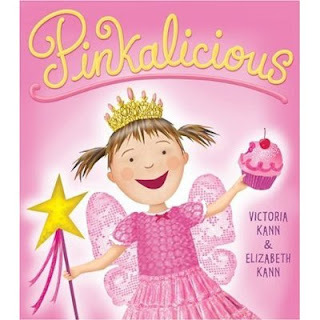 We recently bought the book Pinkalicious which is about a girl who eats too many pink cupcakes and ends up turning completely pink. As soon as Iz finished reading the book she wanted nothing more to become pinkaliscous herself. So being the uber cool mom that I am last night we bought some temporary hair dye. All that ended up happening is that it stained my hands and her scalp and gave her a little pink tinge. Oh well, at least we tried. We gathered up all of her pink dress up clothes and pink makeup in attempt to copy the book as well as we could. Tonight I just snapped a few pics of everyone enjoying our pizza night. Just look at all that tomato stainage! Lucie is mistakenly under the assumption that the body absorbs nutrients through the skin, not the digestive track. Just look at how much yogurt and pizza she smeared all over to make her nice relaxing facial mask. Lately Lucie automatically says cheese every time she sees the camera just like one of those trained chimpanzees. Take a look at this little video clip to see how much of a ham everyone is... well everyone that is except Tygh. Izabella loves taking pictures with my camera. So much in fact, that I gave her my old one so she would stop messing around with mine. When we heard that her school PTA was hosting a contest that included a photography division Iz enthusiastically requested that she participate. The theme for the contest was "Together We Can." I asked Iz to pay attention to what groups of people do together that they couldn't do on their own. Her response was "together we can.... apple pie filling." Isn't it so like a Kindergartner to take it so literally?! She took a bunch of pictures of the neighbors and us picking apples from their orchard, us goofing around, canning apple pie filling, the finished product, and a few pics of us pigging out. I haven't downloaded the pics to this computer, but here's a link to walgreens photo where you can see the pics. We took all of the pics and made a cute little collage poster that Izabella selected. It was really cute. She was so proud of her little self when they called her name at the little award ceremony. They mispronounced our last name, and she gladly corrected them. There were several people that made little aw cute comments when they saw how tiny she was compared to the high schoolers that won the awards right before her. I didn't think that she would brave enough to go by herself across the podium, but she did great. They were kind enough to give her a nice certificate, a ribbon, and a neat gift certificate to craft warehouse. Now her photo collage is moving on from the regional contest to the state competition. Wish us luck! If she doesn't get any further at least we had fun and I got some yummy apple pie filling out of it all. So my sweet baby Lucie Jane turned one last month. If I were an organized Mom, I would have posted pics from her little party and shared her accomplishment (yes making it to her first birthday considering our family is an accomplishment) in a timely matter. On the right, you can see a pic of what she looked like after she ate her cake. She didn't hesitate for a second to try this new found miracle food of a giant slice of cake. We had our neighbors over and the Goveias over and I think she just loved watching all the big kids play. I should have taken more pictures to share with all you birthday party absentees. But alas, I'm always behind these days. So you'll just have to settle for a quick little video clip of her latest game. We call it the Uh Oh, Go Game. She likes to drop things, and say "Uh Oh" until we realize what she's done. When we pick up the object she says "go" and then we toss it back to her. The cutest part of the clip is that she is showing off a little bit of her baby words. She is my little talker. So far we've recognized when she says dog, cat, ball, mama, dad, tank qu (thank you), done, up, uh oh, go, and bye. Lucie started walking a little before she turned one. She just thinks that she is one of the big kids now. If she's not right in there with all the action of the older kids, I can usually find her playing quietly with their toys in their rooms. Lucie's favorite toy is one that I bought for her with the money that my her Great Gandpa sent us. I usually just have Lucie play with hand-me-down toys from the other kids and I don't buy her things that are just hers. Thank you for looking out for our little Lucie and sending her such a great present Granpappy and Sylvia! I bought her this little kitchen set and she just loves it. I think she especially loves the fact that it is just her own. The bigger kids can only play with it if she lets them. I just love the little girl she is turning into. Her personality is definitely her own, but it reeks of that Lybbert Family Flavor. She's a determined and fun loving little bundle of joy and I'm so glad she's a part of our family. It has become a tradition for me to hurdle Spencer down a hill on a sled against his will and then share the video clip with you all. Today my neighbor entrusted me with her daughter Mary and she's the one that you see sliding on to the pavement at the end of the clip. Our favorite place to go sledding is at the church where the kids have preschool. There is a fenced in playground with the perfect hill. Izabella is the legs that you see in the air as she bites it. She ended up doing a backwards somersault. I was worried that she was going to suffer from me cutting out gymnastics from her busy schedule, but she's still got all the skills needed to continue to succeed. After hating the snow due to growing up on the Western side of the state, I think I'm starting to enjoy the winter and I'm accepting the snow. I am not to the point of liking it, but at least it provides good entertainment for me as a parent. At the end of my amusement-at-my-children's-expense experience they are rewarded with a cup of warm hot cocoa. I was told by the lady that the hot chocolate was 99.9% caffeine free, but take a look at Spencer's face and let me know what you think. Last month my brother called in order to inform me that my Dad had a heart attack and he was in the hospital. It completely took me by surprise. My Dad eats healthier than I do and he avoids most red meat altogether, he doesn't have any family history of heart problems, and the guy rides his bike 10 miles a day to and from work. When I got a hold of my Mom (which took an eternity) she explained that Dad had just experienced some chest pain and the doctors said he just experienced a minor heart attack. A minor heart attack?! That's like declaring minor bankruptcy or winning a minor Olympic event. My brother and I were absolutely panicked, but Mom assured us that it was OK. The Doctors decided to keep Dad for observation overnight and they scheduled an angiogram for the morning. Dad's angiogram surprised us all. It showed that Dad had at least seven blocked vessels in his heart. 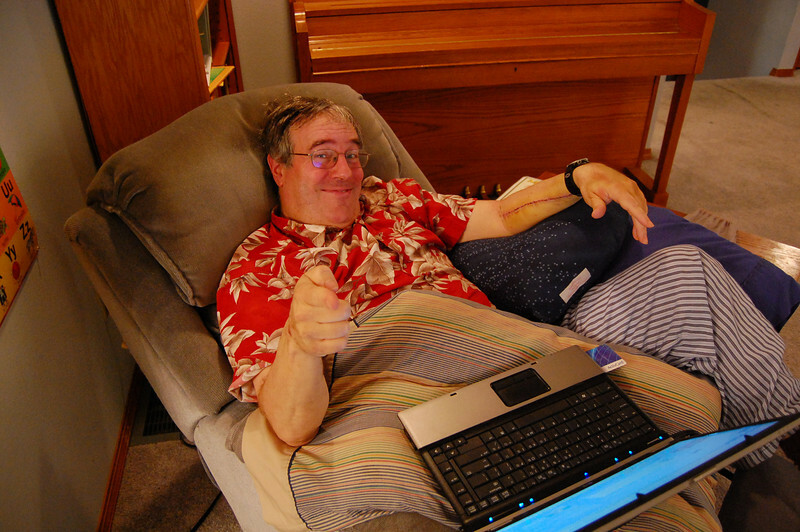 At that point every thing was set in motion for Dad to get a quintuple bipass surgery. Tygh had planned on going hunting with his buddy Scott, but he dropped everything in order to take our little family down so I could be with my Dad right before his surgery. Izabella and Spencer asked a lot of questions and they were quite concerned about their Pappi. Izabella wanted to know "who had been mean to Pappi and broke his heart." I often tell the kids that they are breaking my heart when they don't listen or use harsh language. I guess I'm going to need to amend that saying. Iz also put together that my Dad's name is Claude and his heart was clogged. She and I both thought that was pretty funny. Spencer was worried that it was junk food that broke Pappi's heart and for a day or so, he cried when ever a doughnut or candy was offered to him. He's just my little sensitive guy. When I finally saw Dad in the hospital it was all so surreal. 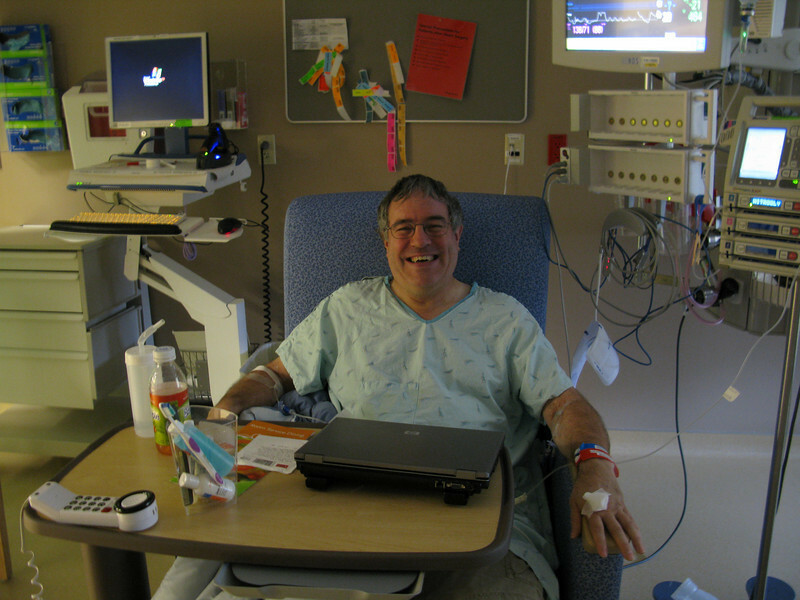 Dad didn't look like himself, but he didn't look like someone with a major blockage in several of his main vessels. 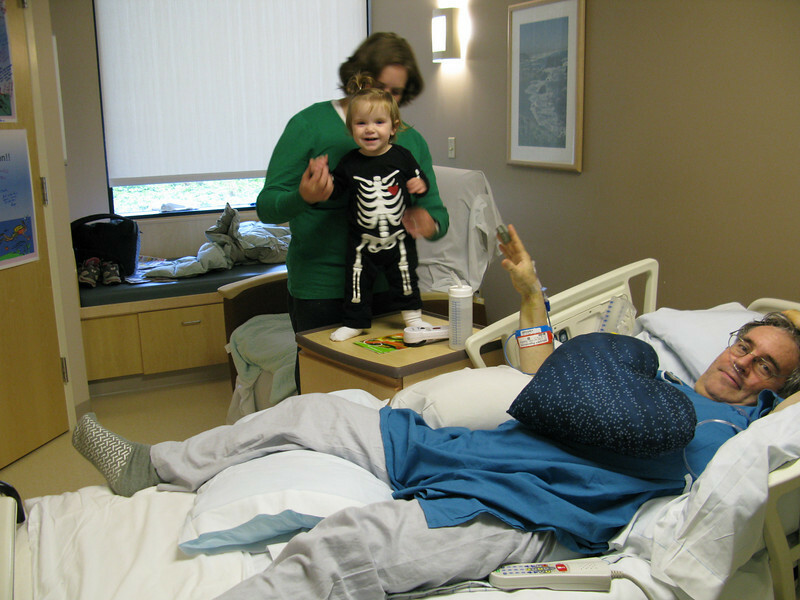 He still kept his terrible sense of humor about him and he kept the nursing staff amused. My Dad was one of the "healthier" guys scheduled for an open heart surgery so we went through days of him being scheduled and rescheduled for surgery. Finally the big day came. For nine hours Dad was in surgery. They stopped his heart and rearranged his veins and arteries. It was absolutely amazing. 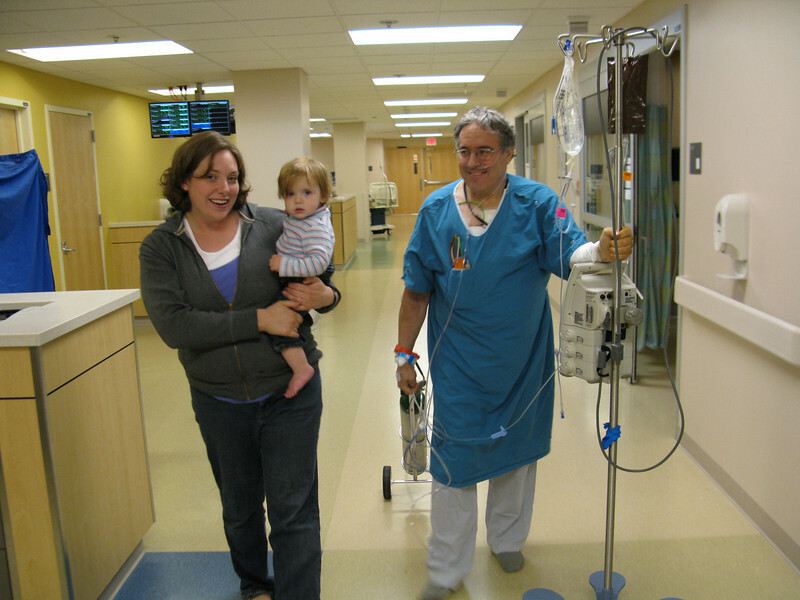 Two days after his surgery, Dad was up and walking the hallways of the cardiac intensive care unit. Since all of the patients are asked to walk for rehab and there really isn't much to look at, naturally you can't help but compare patients. I caught my Dad several times muttering under his breath about how slow the other guys were walking and how the pace was "barely above a shuffle." Dad made it his goal to "blow away the competition" each time he did his laps around the unit. The thing that cracked me up was that Dad was at least 20 years younger than the other patients -so I don't think they were very fast striders to begin with. Dad amazed me with how strong he was at fighting off his pain by being focused on his rehab. My Dad almost fainted when I was born and can't stand the thought of blood, but he did just fine with all of the IVs, tubing, and scars that covered his body. He kept his sense of humor and he was able to keep a positive attitude about his situation. This Thanksgiving, I am even more thankful than ever for family. I'm astounded that Tygh was able to watch the kids for several weekends so I could travel down to help with Dad. If you've ever read my older blog entries, you'd see that usually the kids get into major trouble when Tygh is watching them. This time was different, everyone was on their best behavior. I wasn't able to be around for Halloween, (see the pic on the right to see where Lucie and I were for trick or treating). Tygh braved the ward trunk or treat all on his own and he put together the kids' costumes in my absence. What a great Dad he is. I'm so grateful that they caught Dad's heart attack early and that we have such amazing medical technology available these days. Dad is now out of the hospital and recovering at home in Vancouver. I'm grateful that my Mom was so strong and she is just so good for Dad. My brothers were so supportive during this family crisis. It was great to see how well we were all able to rally around my parents and it brought us closer together. So as I scarfed down my turkey and pumpkin pie yesterday, I thought about how amazing the gift of time with your family is. So tonight for Family Home Evening I tried to teach the kids about Elder Oaks' conference talk from back in 2007 called Good, Better Best. I've been overworked, exhausted and fed up with things lately and I've been trying to weed out good things and focus on keeping the better things that I fill up my day with. Since Izabella is now at school for 7 hours of her day, I feel like the time I have to spend with her is really too precious to be spent watching TV. I decided to bribe the kids with rewards each day they are TV free. At first it was a little hard trying to figure out how to get a long and what we could all do besides zoning in front of the tube, but it is getting to be really fun. I didn't want the kids to think I said no more TV or movies because it is bad, I just wanted them to know that there are better things they can do. I baked 3 different sized cookies for a little object lesson. First I gave them a small oatmeal cookie, that they were really grateful to have and we talked about how it was "thumbs up good." Then I brought out a little bigger cookie and we talked about how it was a better cookie. The kids decided to illustrate this by saying it was better by 2 thumbs up. Then I busted out the mother of all cookies that illustrated what best is like. They gave that the action of 2 thumbs way up. As they were eating their cookies I slowly led them through more examples of good better and best in their daily lives. Like going to church: good, getting there on time: better, getting there on time and not fighting with each other in order to get there on time: best. Watching TV: good, playing with toys:better, playing a learning game together:best. After a few of my examples Izabella wanted to provide her own. She excitedly started with a thumbs up, "Following Jesus is good." Then two thumbs up, "Listening to Mom and Dad is better." So she just ranked my my word above deity. Not bad, but I was wondering about what was coming next. Then she enthusiastically put her hands above her head and declared, "Opening Christmas presents is BEST!" Well at least she got the idea sort of? It all started when Spencer wanted to put a gift tag on a present he picked out for Tygh. Since he can't write yet, he decided to draw a picture of himself and his daddy. I was especially proud of my little man, since I've never seen him draw any people in his pictures yet. Izabella was slightly insulted since she too was there when the gift was purchased, so she added herself to the picture. Then she decided to go a step further, and draw her own family portrait. At first I thought the picture was darling. I just loved my cute skirt and all the happy faces... but then I did a quick head count of the children in the picture. Pictured at the left you can see a happy faced Tygh and I. Then from the right you can see according to Izabella, "Me, Spencer, my baby brother who isn't here yet, the baby girl in your tummy soon, and Lucie." Tygh and I originally thought about having 5 kids, but that was before we hit the 3rd child mark. I am not ready for #4 yet, and the thought of a #5 just plain scares me. Spencer is starting to get down this whole potty training thing. He woke up from his nap yesterday, took off his diaper, used the bathroom, and put on underwear all by himself with out any prompting. I was in the middle of high five-ing him and praising him when Izabella asked him in a stern tone, "Spencer, did you remember to wash your hands?" To which Spencer solemnly replied, "Izabella, it's a choice." Wait a minute, it's optional for boys to wash their hands?! While at BYU, I worked on a custodial staff for a semester. I frequently had to refill the soap in the soap dispenser in the women's bathroom, but not once did I have to add soap to the men's room dispenser. Go figure. I did not spray paint the message on the sidewalk. I merely placed Lucie next to it and took a pic when I saw it. I'm not sure what the original author intended (I think it's for breast cancer awareness), but I do know that Lucie loves nursing. Since Tygh has been fasting for 24 hours with out food each month with out me for the past 5 plus years (I've been preggers of nursing for that long), I decided to find my own way of fasting. In my mind, I think part of fasting is conquering something that you just don't think you can go without. For the past few months I fast from one fast Sunday until the next by giving up something that could be considered a kind of addiction. This isn't a gospel principle, this is just an Aimee thing. I try and pick a gospel principle to study alongside what ever it is I'm giving up, so it's not just about self discipline. July I gave up ice cream. Did you ever stop and think how much the 4th of July and other Summer activities revolve around ice cream? There is a lot. Trust me. Tygh helped me out each night by eating 2 Schwann's ice cream cones in front of me. He'd say that the first one was his as he ate it, and then he'd eat a second and tell me that he mine for me. August I gave up soda. Again, hot weather in Yakima is all about soda. Tygh has been nagging me about how much time I spend on Facebook and he's been asking me to give it up as a monthly fast since I started. I pulled out my calendar and calculated that September is the month that has two fast Sundays because of General Conference in October. So I am going to give this a try. A lot of the time I spend on FB is reading my friends updates, looking at their links, and reading comments. So I figure blogging doesn't count and this will be my crutch until September 26th (not that I'm counting down). I wanted to share this funny little quick story with you. Last week Spencer pretty much was an honorary Kindergartner. He tagged along with Izabella for the first half hour or so at school each day. He really seemed to like the opening circle time that they had. On the walk home, it wasn't uncommon to hear him reciting the poems they learned or singing the songs he heard at school. Thursday the kids made little puppets and acted out Jack and Jill while Mrs. Sauer read the poem to the kids. Spencer decided to take the poem one step further and act it out at home. I was downstairs when I heard Spencer go into the backyard to get something and then I heard him go to the bathroom. Shortly after he went to the bathroom, I heard him calling to me for help. Since Spencer is potty training, I thought little of this event. When I got into the bathroom, I discovered that he was filling a bucket with water. He had got it stuck on the faucet and he wanted me to carry it to the top of the basement stairs. I did as he requested, but I was really puzzled. He tried to clarify and he explained, "Mom, I'm Jack. I need this." I'm pretty slow and I didn't get what he was talking about. He then walked down the stairs and repeated, "Mom, I'm Jack." Izabella got it at this point. "Yeah, and I'm Jill." I then realized that I was holding a pail of water at the top of the "hill." That boy sure can make me laugh the way he thinks! He asked me to get the camera and then the kids acted out the poem and watched and re watched their video clip for over a half an hour. The things we Lybberts do for entertainment. Sunday. A day of rest? My Kids Both Lost Their First Tooth! Halloween, Thanksgiving, and of Course, Disneyland. How Well Do Our Kids Know Us?